According to a new national survey from Ottawa-based Abacus Data, the Conservative Party continues to hold a nine percentage point lead over the NDP nationally with the Liberals back at 20%. Since January, the national vote intention of decided voters has changed very little despite the robocall controversy. Nationally, the Conservative Party has the support of 37% of decided voters (unchanged since January), followed by the NDP at 28% (unchanged), and the Liberal Party at 20% (down one). The Bloc Quebecois is now in first in Quebec with 33% of Quebec decided voters saying they would vote for the separatist opposition party. Regionally, the Conservatives continue to do well in the Prairies (60%), Alberta (64%), and BC (39%) although they are in a statistical tie with the NDP in Canada’s westernmost province. In Ontario, the Tories have a 10-point lead over the Liberals. As other polls have shown in the past week, the BQ is now leading in Quebec garnering 33% of decided voters, followed by the NDP at 28%, the Tories at 17%, and the Liberals at 16%. 38% of Canadians surveyed believed that things in Canada are heading in the right direction while 46% believed things are headed in the wrong track. This is a shift since January and a reversal since August 2011. Back in August, 49% of Canadians surveyed believed the country was headed in the right direction while 31% believed it was headed on the wrong track. This represents a 15-point increase in the “wrong track” measure. 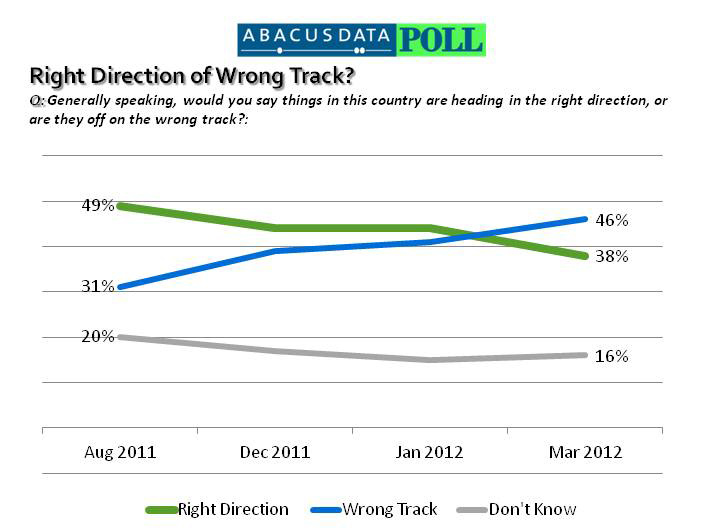 Quebecers continued to be the most likely to believe the country is headed in the wrong direction (55%). Although the Tories’ vote intention numbers were unchanged, the federal government’s approval rating is weaker since January with 49% of Canadians surveyed saying they disapprove of the job the federal government led by Stephen Harper is doing while 37% approve. Since August 2011, the percentage disapproving of the federal government’s performance has increased by 12-points. The government’s approval rating is highest in Alberta (58% approve) and lowest in Quebec (20% approve). The percentage of Canadian disapproving of the federal govenrment’s management of the Canadian economy is up 15 percentage points since January. Thirty-eight percent (38%) either strongly or somewhat approved while 38% either strongly or somewhat disapproved. The remaining 24% neither approved nor disapproved. The personal favourability ratings for Stephen Harper and Bob Rae got worse since January. The percentage viewing Prime Minister Harper unfavourably increased by seven while Bob Rae’s unfavourable numbers increased by six. This month we also examined whether the robocall controversy was having an impact on respondents’ vote intentions. At the time of the survey, the overall impact seems to be negligible as the static ballot numbers suggest. 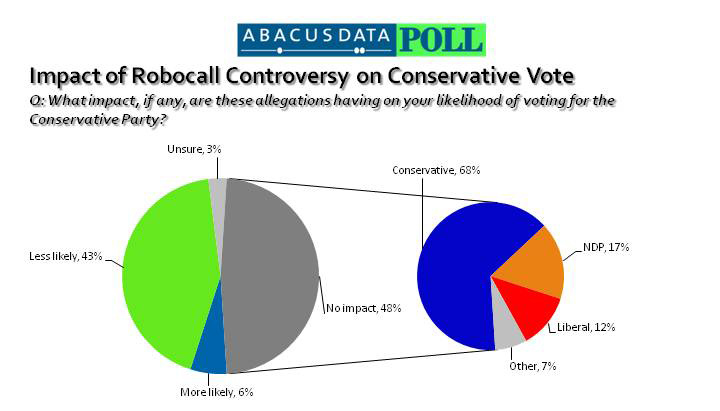 However, we also asked voters directly whether they would be more or less likely to vote Conservative because of the robocall issue, or whether the issue would have no impact on their vote. Overall, 48% of respondents said the issue would have no impact on their vote while 43% said they are less likely to vote Conservative as a result. Six percent said they would be more likely to vote Conservative while 3% were unsure. Among Conservative Party supporters, 78% said the issue would have no impact on their likelihood of voting Conservative (see table). Only 7% of Conservative Party supporters said they would be less likely to vote Tory. In contrast, large percentages of opposition party supporters said they are less likely to vote Conservative as a result of the robocall issue. Or among those who said the issue would have no impact on their vote, 68% would vote Conservative. Looking at it another way, among those who said they voted Conservative in the 2011 federal election, 75% said the issue would have no impact on their vote while 14% said they are more likely to vote Conservative while only 9% said they are less likely to vote Conservative. Therefore, the impact of the robocall issue, as it stands now, is a further polarization of the electorate between those who support the Conservatives and those who don’t. If you focus only on the national vote intention numbers, it would appear that Canadian federal politics is in a state of limbo. 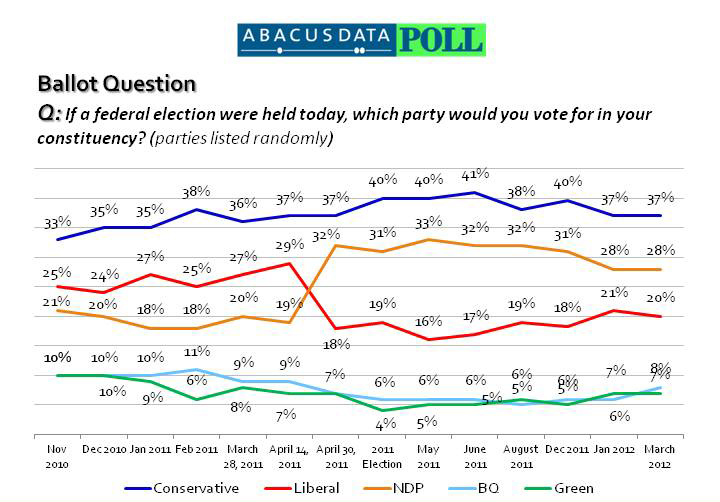 But below the national numbers a number of storms are brewing for both the federal Conservatives and the NDP. The federal government’s approval rating is dropping, more Canadians today think the country is on the wrong track than two months earlier, and Stephen Harper’s personal favourability numbers are in decline. An uncertain economic future and a tough federal budget add more uncertainty to the trajectory of the numbers. Despite all this bad news, the Tories remain in a good position among their core supporters and have a comfortable lead over the opposition. As the federal NDP heads into its leadership convention on March 23, these numbers offer both opportunities and threats. Their lead in Quebec is gone. The Liberal numbers, while not skyrocketing, remain too high for comfort, especially in seat rich Ontario. And despite weeks of bad news and negative media coverage on the robocall issue, the Tories’ vote numbers remain rock solid. The good news is that the party will finally have a permanent leader who can set a clear direction for the party, define its values and vision, and set a course to try and build on Jack Layton’s success.